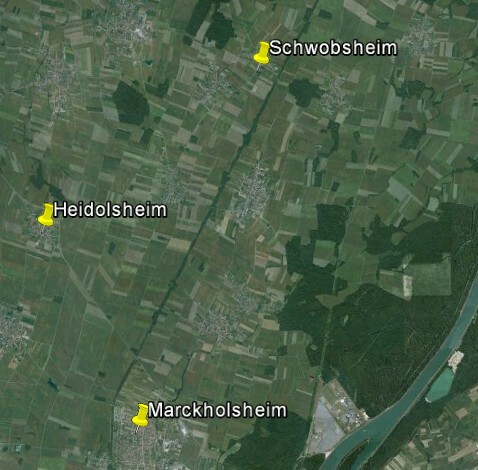 Reference number for this case: 30-Oct-54-Schwobsheim. Thank you for including this reference number in any correspondence with me regarding this case. The bilingual issue of the regional newspaper Dernières Nouvelles d'Alsace for November 3, 1954, reported an observation of Saturday, November 30, 1954, at about 09:30 p.m. in the Schwobstein and Marckholsheim area the Bas-Rhin. One A. H., employee at the Simler butcher, was returnong to Schwobsheim when he saw like a bright silvery fireball followed by a luminous trail. The whole had been visible about twenty seconds, and quickly moved from the Northeast to the Southwest. According to the gendarmerie of Marckolsheim, the observation was confirmed by several witnesses in Schwobsheim and Heidolsheim. Marckolsheim. -- A. H., employee of the Simler butcher, returned to Schwobsheim on Saturday evening around 09:30 p.m. when he saw an extraordinary apparition, like a bright silvery fireball, followed by a luminous trail. The thing was visible for about twenty seconds and was moving rapidly from the Northeast to the Southwest. According to the gendarmerie of Marckolsheim, the observation was confirmed by several witnesses in Schwobsheim and Heidolsheim. This is obviously a description of a meteor. Above: There is about 10 kilometers between Schwobsheim and Marckolsheim. [dn1] * Article in the regional newspaper Dernières Nouvelles d'Alsace, Sélestat issue, France, November 3. 1954. 1.0 Patrick Gross May 3, 2015 First published.